The Santa Fe MPO seeks to make bicycling a safer and more convenient form of everyday transportation for citizens and visitors. Santa Fe is an ideal bicycling environment due to its compact size, moderate terrian, and pleasant weather. A bicyle offers an alternative travel choice for those concerned about the environment, and requires relatively little infrastructure. In addition, bicyles can have travel times comparable with automobiles for short distances and are less expensive to own and operate than automobiles. 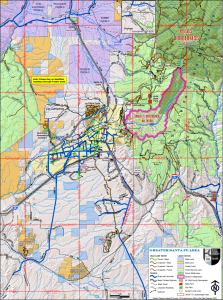 The Santa Fe Bikeways and Trails Map was created through public input to show the perceived suitability of on-street facilities for bicycling. The conditions at specific locations are subjective, always changing, and may vary from what is shown on the map. Please use the map as a community-based guidance to help you select a bicycling route that meets your needs and skill level. Always use caution to evaluate the current roadway conditions. Printed copies of the Map are available at the MPO Offices, City Hall (City Managers Office), Main, La Farge & Southside Library’s, All Area Bike Shops, Santa Fe Convention & Visiors Bureau, New Mexico State Convention and Visitors Bureau, Santa Fe Chamber of Commerce. The 2018 Bikeways and Trails Map can be downloaded below. Please click on the images to access.